The brothers of the community, together with the sisters of the other communities who live in Taizé, would be unable on their own to welcome the large numbers who come throughout the year. The presence of a group of volunteers makes the international meetings possible. The volunteers in Taizé, young people between the ages of 18 and 28, share the various practical tasks in running the youth meetings. However, staying as a volunteer is first of all a chance to think about the next step in life through reflection, regular community prayer and sharing with others. At any one time there are about 40 young men and women staying for a few months or a year. They are not only from Europe, but also from other continents. The youth meetings at Taizé last one week. Someone who wants to stay in Taizé for longer - for example during a gap year - does so in agreement with the community. There is no application form, but to stay for longer you first have to become familiar with the meetings. 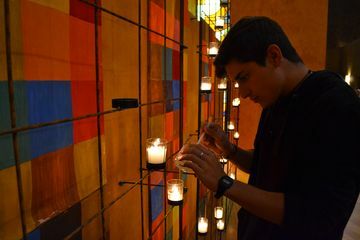 If you wish to stay for a few weeks then write to meetings taize.fr saying a bit about yourself, whether you have already been to Taizé, and what your plans are. If you are already in personal contact with one of the brothers or sisters, it is good to mention that. Those who stay at Taizé for longer than a week have the opportunity to take a step back from their everyday life —to reflect, to share with others and to search inwardly. Each volunteer has a regular meeting with one of the sisters (for women) or one of the brothers (for men) to speak about their own ideas and questions. What will I do if I stay for several weeks at Taizé? The meetings at Taizé are organised on a weekly basis. We ask those who come for a longer stay to spend their first week together with participants staying just one week, choosing from among the different groups on offer. Usually, you would then spend your second and subsequent weeks helping with practical tasks - in cleaning and food preparation teams, in the church, the non-profit café, the camping area - or helping run the meetings in some way - with the 15-16 year old group, the night team, welcoming groups on arrival, etc. It is also possible to choose to spend A week in silence at some point during your stay. Twice a week there is a bible study group with one of the brothers. You don’t need to speak other languages before you come. English is the main language for the volunteer group. Speaking a little French can be helpful for some jobs. You will pick up communication skills faster than you think possible! Do I need to contribute financially? We ask those who come for four weeks or longer to contribute financially for the first week of their stay. After this, you do not need to contribute financially. From the second week onwards you will be given a place in a dormitory together with other volunteers staying for longer. Those staying long-term have accommodation in single or twin-bedded rooms. The volunteers have several meals each week in a smaller group. The brothers organise this for the group of young men, and one of the sisters eats with the women. Is it possible to come with a friend? Coming to Taizé for a longer time is a personal choice, it is therefore important to come individually, rather than with a friend or as a couple. And all the other questions I have?